for €2 by Tenerife beaches. 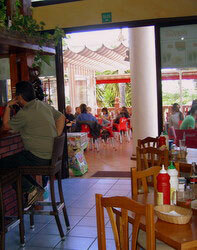 In fact, this cheapest restaurant which only has Cuban staff is a Cuban restaurant called Bar Paraguita, now. 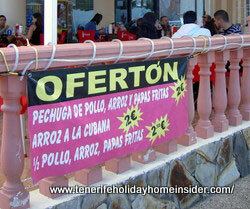 Nobody we know ever heard of a place to eat out on the biggest Canary Island that has such economic menus. By the way, I've only encountered cooked food sold at a pittance in India. It's done with street kitchen food stalls. You can read the incredible, special prices for €2 a dish of the cheapest restaurant on the so called Oferton ( the super offer), as depicted. A generous serving of Cuban cuisine which comes as half a stone grilled boneless chicken called 'Pollo Cubano a la plancha' for €2,50 with real potato chips. 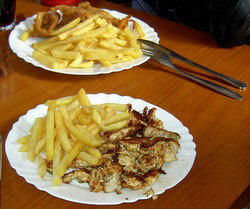 Alternatively, there is 'Pollo empanado' chicken fried with a batter. It costs €2. It also comes with French fries. Cuban food of Caribbean rice with a fried egg, a Vienna sausage, fried green Banana and freshly made French fries. 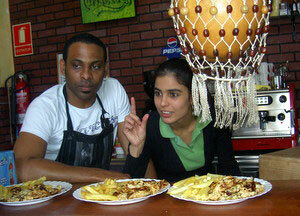 Word of mouth publicity, life music and other frequent events go hand in hand with the Paraguita's low cost cuisine. What does "my so called" cheapest restaurant look like? 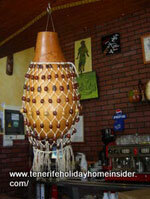 Notice its Caribbean musical instrument a bar decoration. It reminds Cuban love of music and dance while you are eating out. Otherwise, this Puerto Cruz eating haven with an estimated space of about 120 m2 is not small with its great space under a canvas roof(paraguita) outside that's priceless. By the way, the Cuban restaurant is officially only the Bar Paraguita, as it only has one toilet. Station your car with a bit of luck outside the Paraguita, while more than 1km of road opposite is lined with parking spaces in two directions. The depicted beach bar restaurant on Playa Jardin used to serve an excellent, fresh fish dish in summer 2014. It wasn't cheap but, it's worth checking if it's still on... It also had lovely life music. From cheapest restaurant back to Tenerife restaurants cheap where Cuban restaurants are rare, while street food outlets also serve take away cuisine.